On the headland projecting into the North Sea, in the northeast of Yorkshire, there are ruins of Scarborough Castle. 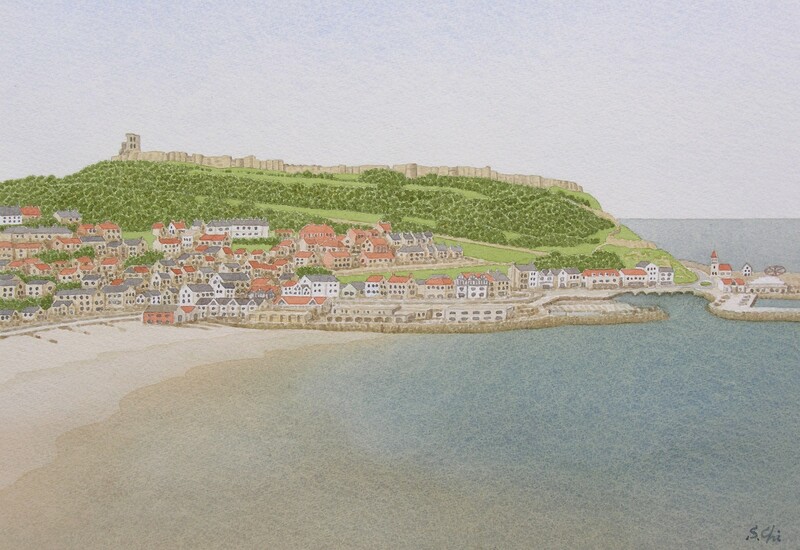 With the curtain walls surrouding a whole headland, called Castle Hill, the huge Scarborough Castle was placed. From the south costal line of the town, a magnificent view of it can be observed. At this site, there had been a signal station of the Romans to provide advance warning of the Anglo-Saxons' pirates. In the Age of the Viking, a group led by a chieftain named Skarthi settled here. He fortified the Roman signal station and used it as his castle, which was called "Skarthi's burgh". It is said that its name had changed to Scarborough and became the name of the town here. There is a tale that Haralda III Hardrada, King of Norway, also landed at Scarborough in September in 1066 before William, Duke of Normandy, later the Conqueror, landed at Pevensey, Sussex on the 28th of September. Haralda destroyed the wooden town of Scarborough by hurling down burning brands from Castle Hill. But the history of Scarborough before the reign of King Stephen is not clear. It was William le Gros, Earl of Albemarle, the Norman, who built a huge castle on the headland at first in 1140 during the anarchy of Stephen's reign. On the west and southwest sides, parts of the curtain walls remain. There is no trace of the keep built by the Earl. Later the castle was owned by the Crown, and Henry II built a great keep to change the castle a mighty fortress. The town grew big below the castle. The court of the castle spreads towards the eastern North Sea in the shape of a fan. The keep lies at the position of its pivot. With measurements of about 550 yards from south to north and about 330 yards from east to west, the court is some the largest one in England. The castle was used by, among others, King John and Edward I. But Edward II, a king with one of the worst reputation in English history, gave the castle to his favorite, Piers de Gaveston. They had been childhood friends. The King's infatuation with Gaveston brought him both unpopularity and rebellion. In 1312, the barons demanded that Gaveston be sentenced to perpetual banishment from England, and they took action to arrest Gaveston. Knowing this, King and his favorite escaped from Windsor Castle, where they stayed at that time, for the north. Running away here and there, in about May, they were at last tracked down at Scarborough Castle by the barons. After three weeks' siege, the King and Gaveston were surrendered, and Gaveston was taken from Scarborough Castle and sent to the south by Aymer de Valence, Earl of Pembroke. On the way, Gaveston fell into the hands of his bitterest enemy, Guy de Beauchamp, Earl of Warrick in Banbury, Oxfordshire and he was executed there in the presence of Thomas, Earl of Lancaster and Edmund FitzAlan, Earl of Arundel on the 19th of June. During the Civil War, the Royalists held Scarborough Castle and it was besieged twice by the Parliamentarians. The Royalists finally surrendered to the Parliamentarians in 1645. During the siege, the castle was mined and partly destroyed to be ruins. Scarborough was once a small centre of fishing and Baltic trade. Since a mineral spring was found near the cliffs of the South Bay in 1626, Scarborough has been known as a spa town. In the late 18th century, burgeoning popularity of taking the waters, Scarborough began to develop rapidly as a watering place, and in the 19th century it became a premier seaside resort of Yorkshire. Anne Bronёspent the last days of her life in Scarborough. She passed away at the age of 29 on the 28th of May in 1849. It was five months later from the death of her sister Emily aged 31. Anne was buried in the graveyard of St Mary's Church. Having four domed towers and dominating the town of Scarborough on the south costal line, the Grand Hotel is another symbol of this town today. The Victorian hotel was designed by Cuthbert Brodrick, the Hull architect who aiso designed the Town Hall of Leeds. This hotel, too, is one of his masterpieces.